Download and install Perl, if necessary. A few of our customers use the free ActivePerl Community Edition. Make a note of where you have installed Perl as this folder will be used in a later step. We have used C:\Perl for this tutorial. 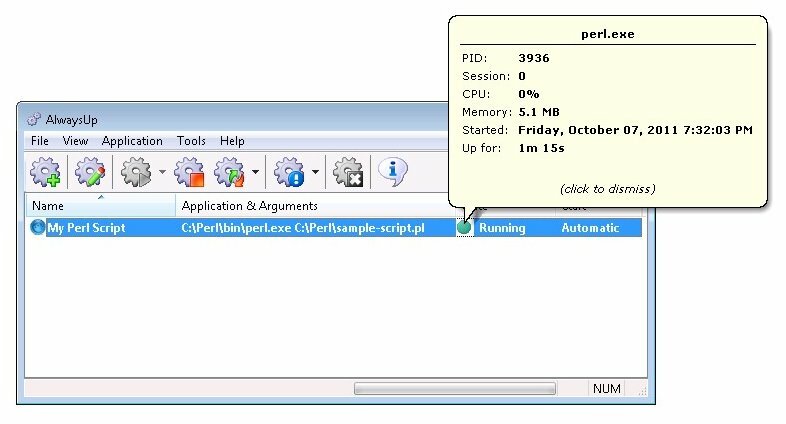 In the Application field, enter the full path to the Perl executable (perl.exe). This is C:\Perl\bin\perl.exe for our installation. In the Arguments field, enter the full path to your Perl script. We want to run our sample script, C:\Perl\sample-script.pl. In the Name field, enter the name that you will call this application in AlwaysUp. We have used My Perl Script but you can specify virtually anything you like. 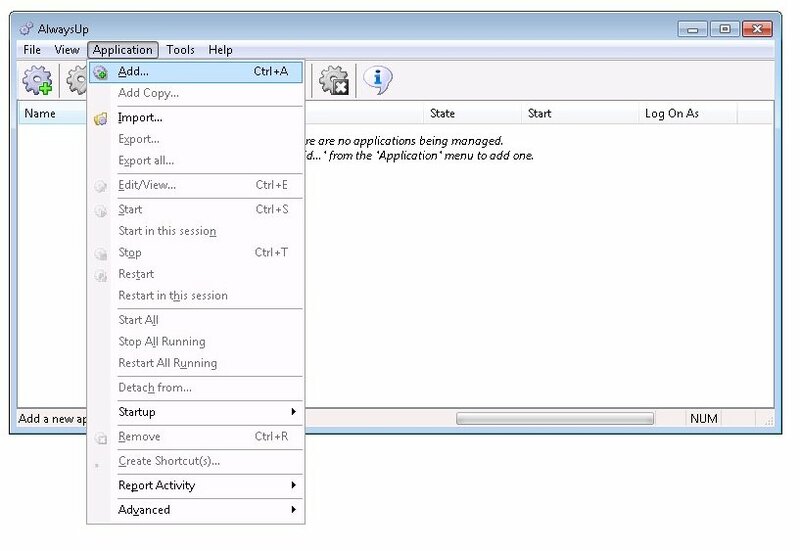 Click over to the LogOn tab and enter the user name and password of the account where you installed Perl. Please ensure that you can run your script successfully from that account. If you only want your script to run periodically (i.e. 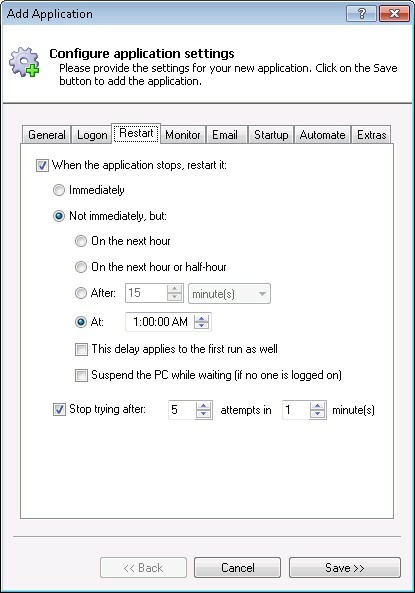 not 24/7), click over to the Restart tab and choose when to run. We would like our script to be run every day at 1 AM. Click the Save >> button. In a couple of seconds, an application called My Perl Script will show up in the AlwaysUp window. It is not yet running though. 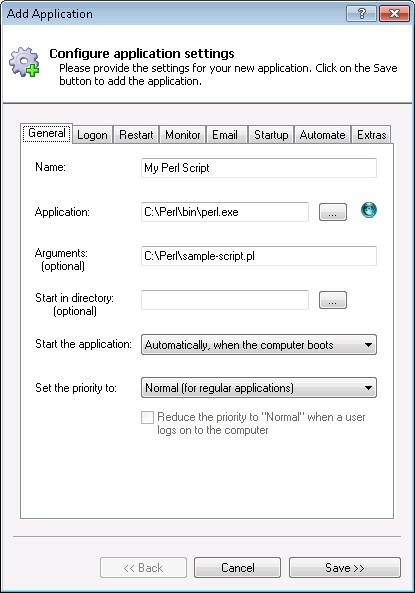 To start the Perl script, choose Application > Start "My Perl Script". That's it! Next time your computer boots, the Perl script be launched immediately, before anyone logs on. We encourage you to explore the many other settings that may be appropriate for your environment. Perl script not working properly as a Windows Service?